It’s Sunday. Must be time to share a Sunday photo then!? Now my daughter has a phone she does not like me taking many pictures of her. Only my Daughter has a knack of taking better selfies than me, I think I try too hard to get the perfect shot!? 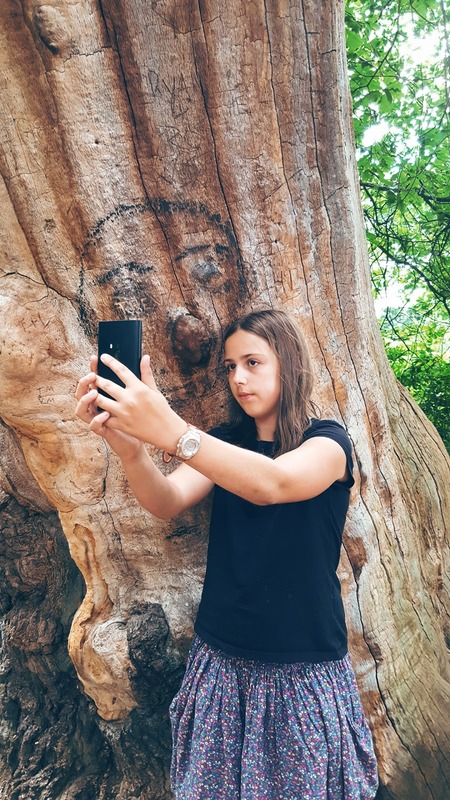 So I took a photo of her taking a photo of her in Sherwood Forest. Lol! A photo of a photo of a selfie. How cool is this tree? It looks it had eyes and a nose on it. It looks like someone made a face on it too. I often see trees that look like they have faces on them. Spooky eh? We had loves of fun in Sherwood forest. There is so much to see and do and so many pretty things to take photos of. We spent hours up here. So much fun running around the forest with Mollie the Collie, finding things to photograph, looking at the Major Oak, having a picnic and having lots of family fun time. Not forgetting to stop by the fairground just before we go home so the children can spend their 2p’s in the slot machines at the fairground. Have you ever visited Sherwood Forest in Nottingham before? The land of Robin Hood. So much history to it too. I love that they keep the Robin Hood theme going strong and you really get a taste of history here. Linking up my photo with My Sunday Photo. "Mango Peach And Passion Fruit Trifles"
Her selfie game is perfect! Haha it looks like it'll be a good selfie. Z is always saying he needs a selfie stick!